From a gentile cycle along the ‘Piste Vert’ to a challenging hill climb up the Pic du Nore – Mazamet is a cyclist’s dream. Starting just 200 metres from the gates of La Villa starts the wonderful ‘Piste Vert’ cycle path that makes use of the former railway line from Mazamet to Bédarieux (around 65km). With a slight incline on the outward leg, the Piste Vert passes through beautiful countryside and villages that make up the Vallée du Thoré. 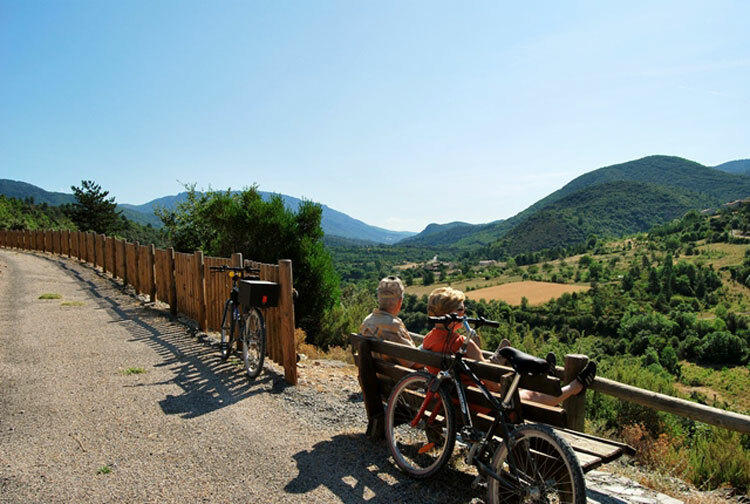 We always suggest to guests they aim for a specific point and the maps we have give distances/durations between certain points along the way – as well as some interesting activities like a visit to the Textile Museum in Labastide or the Grottes de la Devezs – both of which are passed by the cycle path. For those in search of something more challenging, the Montagnes Noire and Monts de Lacaune are your playground. Mazamet’s famous cyclist Laurent Jalabert (a former professional cyclist and Le Tour de France competitor) has a 79km training route which you can follow that rises from 380m to 1,200m…. now that’s serious cycling…. ….and to take your cycling to the next stage, in August (this year the 20th) you can join around 800 others in the annual Jalabert Cycle Race that starts just 150 metres from La Villa. Further information about the various cycle routes in and around Mazamet & the Tarn can be found on our Office du Tourisme website where you could download and print routes.